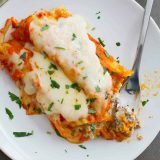 The perfect Sunday supper – this Ground Beef Stuffed Manicotti can be made ahead of time to save you from that dinnertime rush. Filled with ground beef and cheese and topped with a homemade sauce, this is a winning pasta dinner! 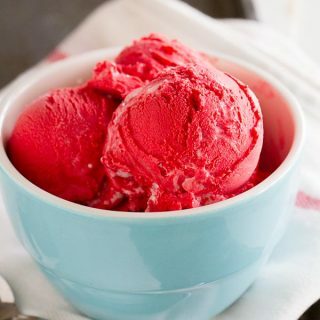 I am trying to get my fill of comfort food in while the weather is still cold, since I know spring is right around the corner! 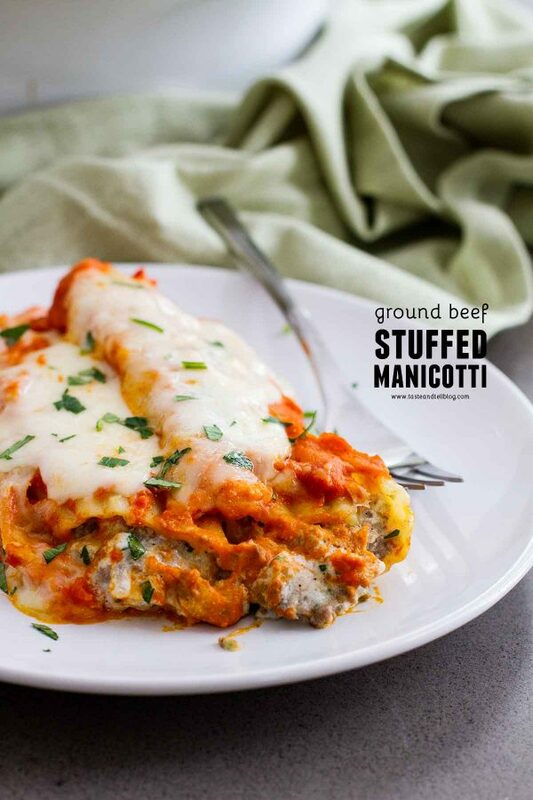 And it doesn’t get more comforting than this Ground Beef Stuffed Manicotti. I’ve been having fun going back through the archives and reworking the really old recipes according to my current preferences (I’ve learned a lot in the past 10+ years about cooking!) 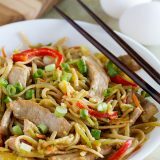 I did end up changing this recipe a bit from the first time I posted it back in 2011, but I think I ended up with a winning recipe! 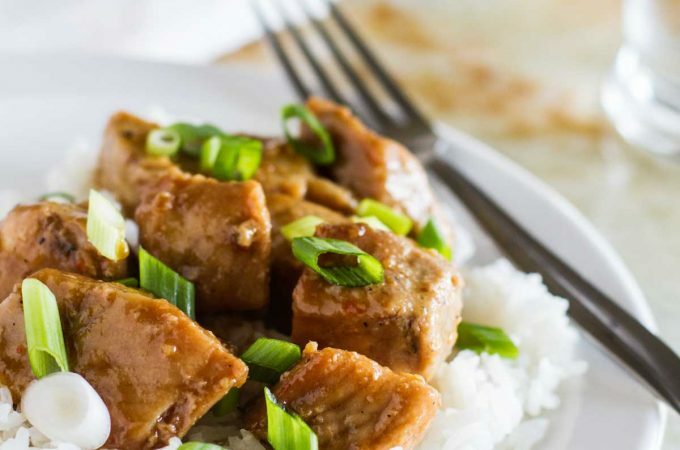 I love that this can be made ahead of time and enjoyed when it’s dinnertime. That sure does take a lot of stress out of the meal! I love make ahead meals. 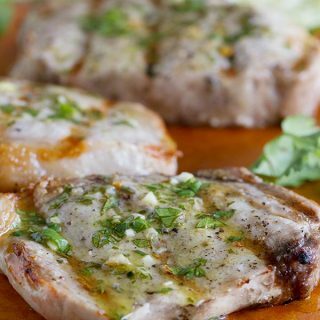 You know the ones that you can make earlier in the day, and then all they need is to be cooked or reheated when it’s time for dinner. 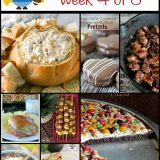 I find myself looking for these kinds of recipes especially for crazy busy days – and Sundays. A little while back, I was feeling really on top of things. It was a Sunday morning, and at the time, we didn’t get home from church until 4pm. On those days, it’s always nice to have dinner pretty much ready so that I’m not rushing to get dinner on the table once we get home. On that particular Sunday, I had this manicotti on the menu plan. This was the perfect recipe to assemble while I had the time in the morning, then refrigerate it until after church, when all I had to do was pop it in the oven. I’m guessing this one would make a great freezer meal as well! Heat olive oil in a large pot or Dutch oven. Add onion and cook until it is translucent. Add in some garlic, then celery and carrots, season with salt and pepper, and cook until the vegetables are soft. Next, add the tomatoes, sugar and bay leaf. Allow the mixture to simmer, breaking up the tomatoes. Simmer the sauce for 1 hour, then remove from the heat. Remove the bay leaf. When the sauce has cooled slightly, transfer the sauce to a blender and process until smooth. You may need to do this in batches. Start by spreading some of the marinara in the bottom of a 9×13-inch baking dish. Set the dish aside. In a skillet, cook the ground beef and onion until the meat is browned. Remove from the heat and allow it to cool slightly. In a bowl, combine ricotta, mozzarella, parmesan, parsley, garlic, salt and pepper. Stir the slightly cooled beef into this cheese mixture. Bring a large pot of water to a boil and cook the manicotti pasta until it is softened, but still somewhat firm. 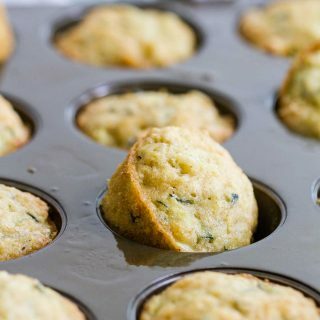 Remove from the water to a baking sheet to cool off. Fill the manicotti shells with the beef and cheese mixture. Place in a single layer in the baking dish. Spread the remaining marinara over the top of the pasta. Sprinkle with more mozzarella and parmesan cheese, then dot the top with butter. Bake until the manicotti is bubbling and hot, then let it sit for 5-10 minutes before serving. I used to always think that stuffing the manicotti shells was the hardest part of making manicotti. But not anymore!! This is what I like to do. Once your filling is prepared, transfer it to a gallon-sized ziplock bag. Cut the corner off, about as big as the inside of the manicotti shell. While holding a manicotti shell, place the tip of the bag in the shell and pipe some of the filling, filling up half of the shell. Turn the shell to the other side and pipe the other end full. 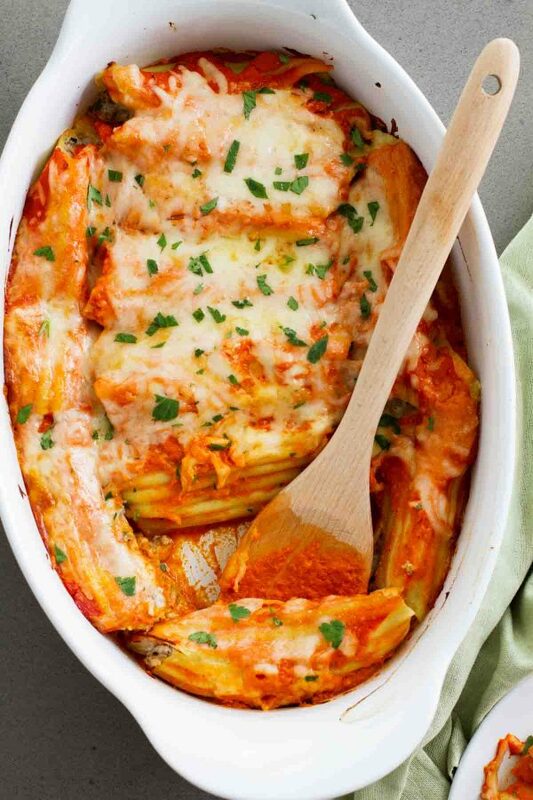 Place the manicotti shell in the baking dish, then repeat with remaining pasta and filling. Want more winning pasta dinner recipes? I like to use a Dutch oven to make the sauce. I use a blender to blend the sauce to make it smooth. I have a Blendtec, but any blender should work. In a large pot or Dutch oven, heat the olive oil over medium-high heat. Add the onion and cook until it softens and is translucent, 5-8 minutes. Add the garlic and cook until fragrant, another 30-60 seconds. Add the celery and carrot along with the salt and pepper and continue to cook until the vegetables are soft, about 10 minutes. Add the tomatoes, sugar and bay leaf. Reduce the heat to low and simmer uncovered breaking up the tomatoes as the sauce cooks. Cook until the sauce thickens, about 1 hour. Remove from the heat and discard the bay leaf. Cool the sauce slightly, then transfer the sauce to a blender (work in batches, if needed) and process until smooth. Preheat the oven to 350ºF. Spray a 9×13-inch baking dish with nonstick cooking spray. Spread 3/4 cup of the prepared sauce in the bottom of the dish. Set aside. Place a skillet over medium heat and add the ground beef and onion. Cook, breaking up the meat as it cooks, until the meat is browned and the onion is soft. Remove from the heat and allow the mixture to cool slightly. 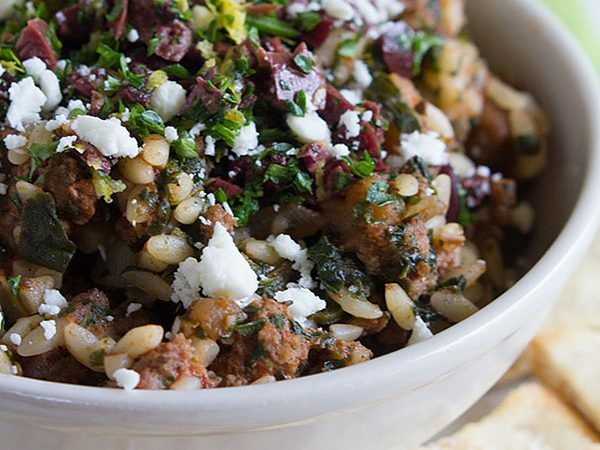 While the beef is cooling, mix the ricotta, one cup of the Mozzarella, 1/4 cup of the Parmesan, the parsley, garlic, salt and pepper in a bowl. When the beef mixture has cooled slightly stir it into the cheese mixture. Bring a large pot of water to a boil. Salt generously. Add the manicotti and cook until it is softened, but still firm to the bite, about 6 minutes. 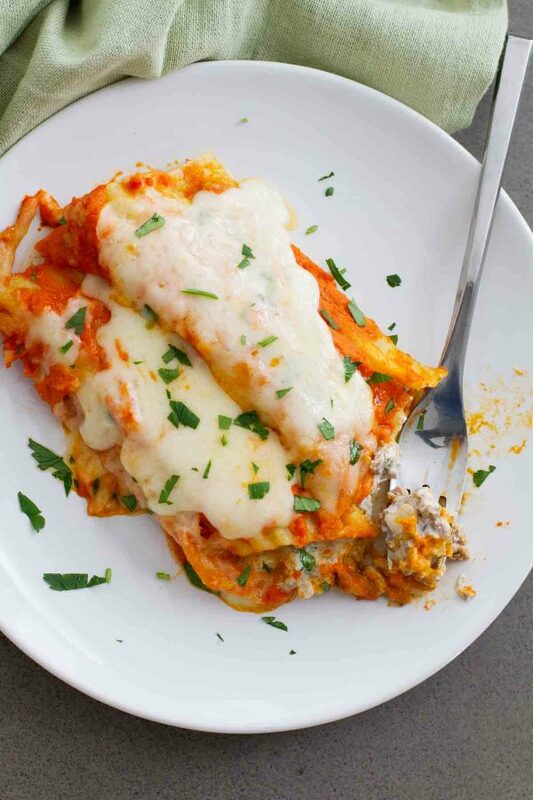 Remove the manicotti from the water and transfer to a baking sheet to cool off. Transfer the meat and cheese mixture to a large ziplock bag. Cut off the corner. 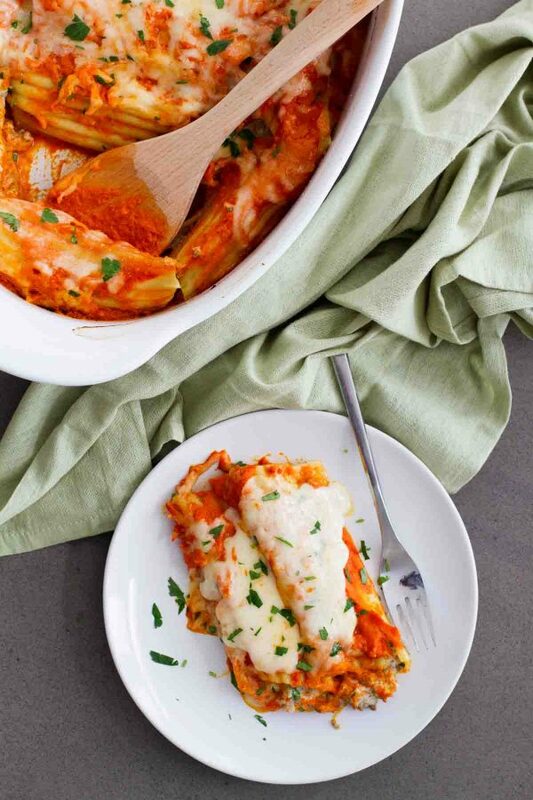 Squeeze the mixture into the manicotti and place the stuffed pasta in the baking dish in a single layer. Spread the remaining sauce over the top of the pasta. Sprinkle the remaining 1/2 cup of Mozzarella and 1/4 cup of Parmesan over the top. Dot with the butter pieces. Bake the manicotti, uncovered, until it is heated through and the sauce is bubbling and hot, about 35 minutes. Let the manicotti sit for 5-10 minutes before serving. Sauce can be made ahead of time. Cool the sauce, cover and refrigerate until needed. 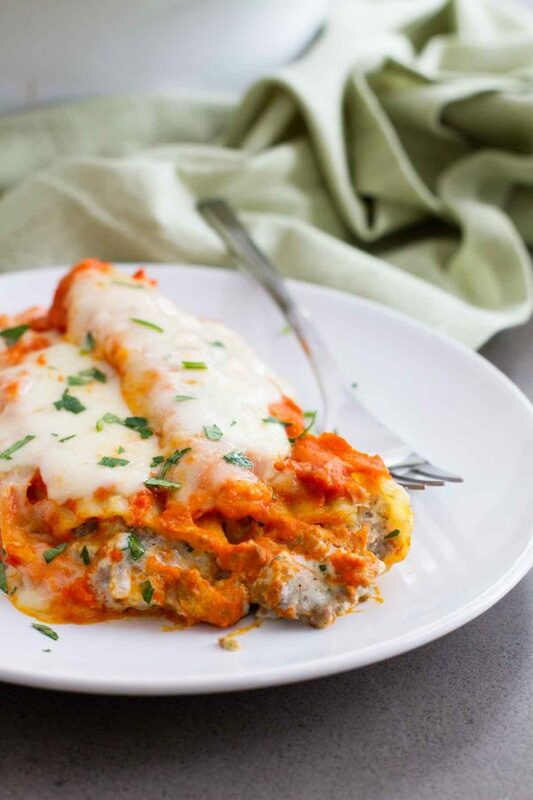 The manicotti can be made ahead of time. 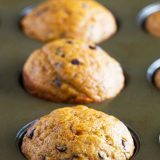 Prepare up to the point of baking, but cover and refrigerate. Bring to room temperature before baking through. 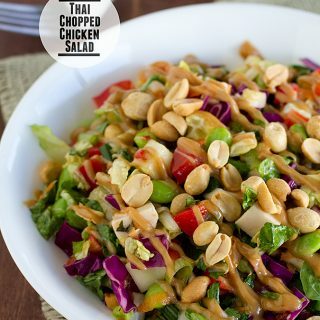 Make ahead meals are definitely fabulous tools! My main problem is planning that far ahead! These look delicious though! Total comfort food. I completely agree about make ahead meals. If I had the ability to start my blog all over again, that would be my focus. Having something all ready to go in the freezer or fridge that just needs baking off is better than money in the bank, IMO. Especially when it’s something this hearty and delicious. Thanks for sharing! Yes, I so agree with make ahead meals. This looks so colorful and delicious!